This standard gauge tramway line has been long in the making. First initiatives were taken in 1882 and serious plans were issued in 1889, at the height of the "tram boom". It wasn't until 1901 before a first plan for a meter gauge connection to the Belgian tramway network was granted a concession. As these failed to materialize discussion arose in 1907 about the choice of traction (steam or electric) the route and the gauge. The province of Limburg wanted a modern line, electrically operated and standard gauge. When AEG entered the discussion in 1910 by, undoubtedly unselfishly, proposing an electric tramway line, pandemonium was complete. This proposal was granted a concession in 1912. Work was even actually started but abruptly ended at the start of the Great War, AEG belonging to the one of the warring parties and the Dutch being neutral. After cessation of hostilities AEG made clear they wanted to bail out and the concession was withdrawn in 1919. A government committee studied the various options to bring the on-going and increasingly heated discussion to a satisfying conclusion. The line was redesigned and the decision was handed down in favour of a steam operated standard gauge line. Work started in 1921 and section Wijlre-Vaals was opened in 1922. Maasticht-Gulpen followed in 1925. Economically the tide had turned terribly and the line was typically "too little too late". The tramway boom had long vanished into history, busses made the day, the new line was incompatible with the bulk of the LTM network which was electrically operated on meter gauge, and of course the line was pestered by the economic downturn of the twenties. All ingredients for disaster were in place and the LTM didn't fail to fail. Maastricht-Vaals never earned as much a single cent and operation ceased in 1938 and the line was broken up in the following year. The shame of the fiasco was so deep that even the people of Limburg can't remember the line. 1938. An NS 6200 towing LTM locomotives and rolling stock to Dotremont's after the goodbye party in Maasticht. The first LTM locomotive in line is de LTM51 Garratt, the others are the Hanomags B-couplers. After completing my NS 6200 and this SHM 26 I could partially recreate the scene. These locomotives were ordered for operation on the standard gauge lines of the Limburg Tramway Company (LTM). They served on the lines Maastricht-Vaals and Roermond-Sittard and its four branches. They were supplied by Hanomag in two batches in 1922 and 1925. They were relative "muscle cars" as they needed to operate on a "mountainous" line, the Maastricht line being laid out in the hills of Limburg with relatively steep gradients. They were the heaviest 0-4-0 tramway locomotives of the Netherlands. They performed well and could easily go faster than the designated speed limit. Yet, in hindsight, lighter locos would have sufficed. The engines showed every mark of the Verhoop design like its feedwater system with Verhoop pump, vacuum brake preheater, smokebox feedwater heater and water treater. The locos 21 and 34 collided head on at Wahlwiler on July 14,1935 resulting in heavy damage on both engines. The already strained finances led to the decision not to repair the locos and they were scrapped soon thereafter. 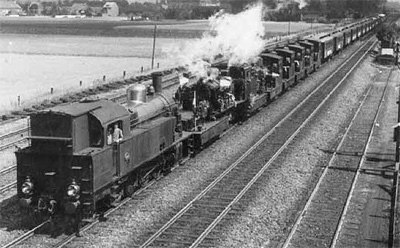 Twelve engines were sold to Dotremont metal traders at the cessation op operation on the line Maastricht-Vaals in 1938. One loco was sold to the State Mines directly and two others were acquired from Dotremont. No 26 was sold to Dotremont. After some time it was sold to a German company and via various other mean time jobs it was bought back into the Netherlands by the Tramway Foundation in 1972. After a thorough restauration it re-entered service in 1972, numbered 21. This loco was actually a composition of the frame of 26 and the boiler of 21. The frame of 21 was scrapped. During its 2000 rebuild it was soon dicovered and it was numbered correctly after its frame number, 26. The loco was returned to its original state as much as possible. It received a new cab, a new boiler and of course new number plates.